I’ve written this post to help readers understand potential physical mechanisms behind cosmic-ray/cloud connections. But first I briefly want to explain my motivation. Prior to the publication of the aerosol nucleation results from the CLOUD experiment at CERN in Nature several weeks ago Kirkby et al, 2011, I was asked by Nature Geoscience to write a “News and Views” on the CLOUD results for a general science audience. As an aerosol scientist, I found the results showing the detailed measurements of the influences of ammonia, organics and ions from galactic cosmic rays on aerosol formation exciting. While none of the results were entirely unexpected, the paper still represents a major step forward in our understanding of particle formation. This excitement is what I tried to convey to the general scientific audience in the News and Views piece. However, I only used a small portion of the editorial to discuss the implications to cosmic rays and clouds because (1) I felt that these implications represented only a small portion of the CLOUD findings, and (2) the CLOUD results address only one of several necessary conditions for cosmic rays to affect clouds, and have not yet tested the others. Many of the news articles and blog posts covering the CLOUD article understandably focused much more on the cosmic-ray/cloud connection as it is easy to tie this connection into the climate debate. While many of the articles did a good job at reporting the CLOUD results within the big picture of cosmic-ray/cloud connections, some articles erroneously claimed that the CLOUD results proved the physics behind a strong cosmic-ray/cloud/climate connection, and others still just got it very muddled. A person hoping to learn more about cosmic rays and clouds likely ended up confused after reading the range of articles published. This potential confusion (along with many great questions and comments in Gavin’s CLOUD post) motivated me to write a general overview of the potential physical mechanisms for cosmic rays affecting clouds. In this post, I will focus on what we know and don’t know regarding the two major proposed physical mechanisms connecting cosmic rays to clouds and climate. These two proposed mechanisms are the ion-aerosol clear-sky hypothesis and the ion-aerosol near-cloud hypothesis (using the terminology from Carslaw et al., 2002). The ion-aerosol clear-sky hypothesis has gotten most of the mainstream attention, and the recent CLOUD results test a portion of this hypothesis. The near-cloud hypothesis has received less attention. I believe this is because little is known about many of the processes involved. Regardless, it is a fascinating and plausible hypothesis, so I will also address it here. The central question we need to answer in either of these hypotheses is “How much do clouds change due to a change in cosmic rays?”. The central theme of the clear-sky hypothesis is that cosmic rays affect ion concentrations in the atmosphere. Aerosol nucleation (the formation of ~1 nm particles in the atmosphere) is generally enhanced by the presence of ions. The particles formed through nucleation may grow through condensation of sulfuric acid and organic vapors to sizes where they can act as Cloud Condensation Nuclei (CCN) (the particles on which cloud drops form). If CCN are exposed to relative humidities above 100%, cloud droplets will form on them. Thus, a change in cosmic rays could potentially affect the number of cloud drops, which in turn may affect the amount of sunlight reflected by a cloud, the formation of precipitation and the cloud lifetime. Figure 1. Overview of freshly nucleated particles, CCN and cloud droplets. How much does ion formation in the atmosphere change due to changes in the cosmic-ray flux to the atmosphere (due to the solar cycle etc.)? How much do aerosol nucleation rates change due to changes in ion formation rates? How much do CCN concentrations change due to changes in aerosol nucleation rates? How much do clouds change due to changes in CCN concentrations? Question 1: How much does ion formation in the atmosphere change due to changes in the cosmic-ray flux to the atmosphere? Of the four questions, we understand question 1 the best. With current information about the Earth’s magnetic field and solar activity, we have fairly robust predictions of the ion formation rate from cosmic rays. The figure below shows the percent change in the ion formation rate from cosmic rays between the solar minimum (more cosmic rays) and solar maximum (fewer cosmic rays) Usoskin and Kovaltsov, 2006. Figure 2. Percent change in the ion formation rate as a function of height and latitude in the atmosphere from cosmic rays between a typical solar minimum and solar maximum in the troposphere and lower stratosphere. Question 2: How much do aerosol nucleation rates change due to changes in ion formation rates? Figure 3. Figure 2 from Kirkby et al. (2011) showing the nucleation rate as a function of ion concentration for two different conditions (the two colored lines). Question #3: How much do CCN concentrations change due to changes in aerosol nucleation rates? The impact of changing aerosol nucleation rates on CCN concentrations has recently been studied using several different models Spracklen et al, 2008Makkonen et al, 2009Wang and Penner, 2009Yu and Luo, 2009. In all cases, the change in CCN is smaller than the change in nucleation rates. Two other papers Pierce and Adams, 2009, Snow-Kropla et al., 2011 have specifically looked at this question in the context of cosmic-ray changes, and found that even though nucleation rates are changing by 1-5% throughout much of the troposphere, the changes in CCN are generally around 0.1-0.2% throughout much of the globe. The reason for this strong dampening is shown in the figure below. Firstly, primary emissions contribute to CCN as well as nucleation, and the primary emissions are not affected by cosmic rays. Secondly, the likelihood that a freshly nucleated particle will grow to become a CCN depends on whether it can grow from condensation of sulfuric acid and organic vapors onto it before the particle coagulates with a larger particle (reducing the number of particles). If the nucleation rate is increased due to cosmic rays, there will be more particles competing for a fixed amount of condensible vapors, and each new particle will grow more slowly. Additionally, the coagulation loss of the particles will increase due to the increased number of particles and the slower growth (particles are lost through coagulation more quickly at smaller sizes). Unfortunately, as far as I know this question has only been addressed using models. While we test the model for known uncertainties in model inputs, it is always a possibility that we are missing something. Fortunately, the growth of ultrafine particles to CCN sizes should be addressed in future experiments in the CLOUD chamber, so we should soon also have controlled experimental evidence to compare with model results. Question #4: How much do clouds change due to changes in CCN concentrations? Increased CCN concentrations lead to increased concentrations of cloud droplets. More cloud droplets will lead to increased reflection of sunlight from the cloud to space, and may under some circumstances lead to a reduction of precipitation and an increased lifetime of the cloud. How much these cloud properties depend on CCN concentrations is a major area of research in general. CCN concentrations have more than doubled in many polluted regions due to human-generated emissions, so we are working hard to understand how this has affected clouds. Given that CCN concentrations have changed so much from human influence, a change in CCN of less than 1% due to cosmic rays seems quite minor. Indeed, cloud reflectivity, precipitation and cloud lifetime will generally change by less than the change in CCN for most clouds (e.g. we know that cloud cover has not more than doubled due to human-generated emissions). Therefore, it is unlikely to generate a ~6% change in cloud cover (reported in observations of clouds with 11-year solar cycle and after Forbush decreases) from less than a 1% change in CCN. The ion-aerosol near-cloud hypothesis has received less attention than the clear-sky hypothesis; however, there is still active research being done on it. The near-cloud hypothesis has to do with the global electric circuit (see the figure below). Figure 5. Schematic showing how cosmic rays modulate the global electric circuit and may affect the charging around clouds. Thunderstorms create a charge separation with positive ions at the top of the cloud and a negative ions at the bottom (this negative charge gets discharged through lightning to the ground). The positive charge at the top of the cloud moves through the conductive upper atmosphere to the ionosphere giving the ionosphere a positive charge. The difference in charge between the ionosphere and the Earth’s surface drives an electric current from the ionosphere to the surface. The resistance of the atmosphere to current flow depends on the ion concentrations (more ions = less resistance). Thus, when more cosmic rays enter the atmosphere, electricity flows more quickly through the atmosphere. Non-thunderstorm clouds, however, interrupt the electric current because gas-phase ion concentrations within clouds are very low making the clouds very resistive to electric current flow. Charge builds up on the top and bottom of the cloud much like charged plates in a capacitor. Cosmic rays may affect this charge build up through changing the resistance of current flow in the clear atmosphere; however, the strength of this effect is still not well known. This may have an effect on the cloud properties by enhancing the collision rate between cloud droplets and between aerosols and cloud droplets. Often in clouds, liquid water drops will exist even when temperatures are well below 0ºC (freezing point of water). Collisions between the charged aerosols with these supercooled cloud droplets may enable the freezing of these droplets, which could lead to cloud invigoration due to the heat released from freezing or enhanced precipitation (clouds consisting of both liquid drops and ice crystals are more effective at generating precipitations than clouds containing only one phase drops/crystals). These effects, however, are all still very uncertain. Figure 6. The enhancement of droplet freezing by collisions with charged aerosol is an essential component of the near-cloud mechanism, but is not well understood. The uncertainties in the near-cloud mechanism far exceed those of the clear-sky mechanism (it is not even clear whether a change in the cosmic-ray flux would lead to more or less cloud cover through the near-cloud mechanism). However, it remains an interesting potential connection between cosmic rays and clouds that needs to be explored if we are to understand how cosmic rays may affect clouds. Thanks for a very useful summary. Hadn’t even heard of the ‘near-cloud’ hypothesis! Dr. Pierce, Very nice article! I thoroughly enjoyed it. Perhaps this is verification that the mechanism shown in your Figure 4 works. Thanks from me too. Could someone setup Figure 5 with a link to the fullsize image? The scaled version that appears on the page is difficult to read. Paul S: Here is the link for the full-sized figure 5 (http://fizz.phys.dal.ca/~pierce/elect_circuit_web.png). Can one of the RC folk link this? Thanks for this essay! This is a real contribution to the understanding of climate-related science among those trying to understand. The reported observed relative change in low cloud cover  is ~6% with the solar cycle (or 2% absolute change in the fraction that low clouds cover the planet). What do you think of the point the AGW Observer makes here that the change in cloud cover found in  may be an artifact? Excellent explanation. What is clear is that SOx concentrations are limiting, but there may be synergistic effects from other species such as NOx. An interesting situation may occur when SOx is NOT limiting, such as over Mexico City as studied by the Molinas. muoncounter: Interesting question. SEP events can have a strong affect on stratospheric chemistry with large changes in ozone and NOx concentrations (e.g. http://www.atmos-chem-phys.net/11/9089/2011/acp-11-9089-2011.html). There is a long history of research on this; however, I don’t know if there is any connection between these stratospheric changes and changes in cloud cover, though this would be an interesting topic to explore. The Mironova paper shows very interesting results. However, something else must be going on in the stratosphere other than the clear-sky mechanism. Have a look at Figure 4 in Miranova. The aerosol extinction coefficients increase by an order of magnitude after the event. This could not be done without additional aerosol mass after the SEP because stratospheric aerosols generally have sizes that are near the peak in extinction efficiency. In other words, you couldn’t get an increase in aerosol extinction coefficient by an order of magnitude by changing aerosol size alone (if the clear-sky mechanism was acting alone, this would be the case). Thus something is clearly happening in the Mironova paper that is increasing aerosol mass. This might be a polar stratospheric cloud or perhaps a change in chemistry. I’m not sure exactly what it is, but it can’t be the clear-sky mechanism acting alone. Pete, in the ISCCP results low clouds cover ~30% of the Earth. The 2% change is the change in this value (e.g. 29% to 31%). Thus, the relative change in low cloud cover is around 6% (2/30*100). From the ISCCP data description page (http://isccp.giss.nasa.gov/products/variables.html) “low clouds have top pressures greater than or equal to 680 mb”. 680 mb would generally be 3-4 km above sea-level. I’ll take a look at your link to AGW observer tonight. Thanks! Thank you for this interesting summary. I am interested in your thoughts on the work of Nir Shaviv, whom you haven’t mentioned. …it is well known that solar variability has a large effect on climate. In fact, the effect can be quantified and shown to be 6 to 7 times larger than one could naively expect from just changes in the total solar irradiance. This was shown by using the oceans as a huge calorimeter (e.g., as described here). Namely, an amplification mechanism must be operating. He refers to Nir J. Shaviv (2008); Using the oceans as a calorimeter to quantify the solar radiative forcing, J. Geophys. Res., 113, A11101, doi:10.1029/2007JA012989. Eli: Thanks for these thoughts. Nitrate, the aerosol species that comes from NOx tends to condense onto larger aerosols and do not aid in the growth of nucleated particles to CCN sizes. Organic aerosols, however, can dominate the growth of nucleated particles in many regions of the world. Organic aerosols and the affect of CCN are a very active area of research. Our work looking at the global sensitivity of CCN to cosmic rays does include organic aerosols (as well as a 2nd simulation where we increase the amount of condensible organics to test the sensitivity), http://www.atmos-chem-phys.net/11/9019/2011/acp-11-9019-2011.html. The additional condensible material didn’t actually increase the sensitivity of CCN to cosmic rays. This is because the increase growth rates were roughly canceled by increase coagulation rates (do to more massive aerosols to scavenge the freshly nucleated particles). Still definitely an uncertainty though. Cheers. Very nice and clear — special thanks for the helpful graphics! The hurdles facing the “clear-sky” hypothesis will be known to anyone who’s followed this blog with an interest in solar connections, but though I’ve been vaguely aware of the “near-cloud” hypothesis (from brief mentions in AR4 and Gray 2010, I think), I haven’t seen it explained for us general readers before. Thank you. An excellent post, both well organized and clear, touching on detailed science without being overwhelming. A good way to kick-start the brain on a Monday. Alex Harvey: I know Nir Shaviv a bit (we were both external examiners on one of Svensmark’s students PhD defenses, and I got to chat with him a bunch then). As far as I know, his work mostly deals with the space physics end of cosmic rays and has looked at some historic climate correlations with cosmic rays. I don’t think he hasn’t worked on the aerosol/cloud physics side of things, so I am not extremely familiar with his work. The critical statement in Nir’s post is, “Since many regions of earth are devoid of natural sources for CCNs (e.g., dust), the CCNs have to grow from the smaller CNs, hence, the CCN density will naturally be affected by the ionization, and therefore, the cosmic ray flux.” Yes, CCN will change due to changes in ionization, but by how much? Even in regions without primary emissions (which can be anthropogenic as well as natural, e.g. combustion sources) changes in fractional changes in CCN will be smaller than fractional changes in nucleation/ionization due to slower growth and faster coagulation when nucleation is faster (e.g. Figure 4). Aren’t there dried salt specks over the oceans, black carbon and other dust in the Arctic, dust from Africa readily reaches Florida, bacteria are in the air most places. Where are the dustless places? Antarctica? The Graph of the Cosmic ray flux linked in the post shows decreasing minima ( at solar max)through solar cycles 20 – 22 and integrating the total flux through that period and allowing for about a ten year time lag would correlate reasonably well with the temperature rise from 75 – 2003. Since the 22 flux minimum the cosmic ray flux increased to a peak not seen on rest of the graph in the 23 – 24 solar minimum . This matches rather suggestively the declining temperature trend since about 2003 and suggests that by 2020 temperatures will decline significantly. I think these empirical observations are more than co-incidence. I agree the mechanisms are still obscure. However the tide guage series he uses shows a magnitude of variability that is absent in the more recent parts of the record where global scale sea level is measured by satellites. So it’s questionable whether the magnitude of the thermal response to the solar cycle is correct; the near land shallow water tide guage series may simply have enhanced warming/cooling response that isn’t representative of the ocean in its entirety. Additionally, Shaviv neglected to account for the volcanic contribution to cooling that is in phase with two of the solar cycles used by Shaviv (as described by Lean and Rind). That will also cause an overestimate of the apparent ocean thermal response to the solar cycle. That’s not to say that there isn’t an ocean thermal response to the solar cycle; there must be one. Note also that a larger response than is supported by consideration of the solar irradiance variability should arise if there is a positive cloud feedback to surface warming, which is supported to some extent by recent work (Dessler and Clement for example). So nothing necessarily to do with the CRF, and as for an accountably large discrepancy between the thermal response and the irradiance component of the solar cycle, I’d consider the verdict is “not proven” (as we say in Scotland). Good question. There aren’t really any regions of the atmosphere free of primary particles. However, some areas such as higher up in the troposphere (above a few kilometers) can have particle number concentrations that are very dominated by particles formed through nucleation. Even in some locations near the Earth’s surface nucleated particles can comprise more than 50% of the CCN. I am a bit confused by two of your statements Here you have written “it appears unlikely to me (and most other scientists working on aerosol-cloud interactions who’ve shared their thoughts on this hypothesis with me) that this mechanism will be strong enough to greatly change clouds?” In Nature Geo Science you wrote “”Atmospheric aerosols strongly influence Earth’s climate, but how they form has remained a mystery. According to cloud chamber experiments, a mixture of vapours, as well as ions formed by galactic cosmic rays, contribute to the particle formation recipe”. How may your reader reconcile these? … and that given that change in cloud properties, you would need to show that it had a significant effect on radiative forcing. Regarding Norman Page’s alleged cooling trends. A glance at the graphs of global temperature shows that the so-called cooling periods did not cool very much, while the warming periods showed substantial warming. This is evidence that the overall warming trend is alternately offset & amplified by a periodic climate cycle (perhaps the sun), but in now way contradicts the fact of an overall warming trend that correlates very closely to the increase of greenhouse gases. #17–Yep. Test for significance before pontificating, please! I have a question about how well the neutron monitor data reflects the ionization? According to Svensmarks hypothesis secondary mouns are most important for ionization of the lower atmosphere and though there is a very good correlation between neutron and muon count they are, as far as I understand, not quite the same? MMC Norilsk Nickel, Norilsk, Krasnoyarsk Krai, Russia -Ground Zero for Arctic Sea Ice Melt/Atmospheric Forcing? a) North of 60 degrees lattitude. b) Largest SO2, HS, and CO2 emitter north of 60 degrees latitude. c) Major supplier of “Arctic Haze”? d) Close enough for Sea Breeze effect? e) No trees (above treeline and vegetation dead due to Norilsk being one of most polluted places on third rock from the sun). e) Arctic temperatures maximizing nucleation? Thanks for posting here. I enjoyed reading your post. The following paper is being presented by some as evidence that GCRs have a notable affect on cloud cover. Do you have any thoughts? Thank you. That was very good. #25, MapleLeaf: Yes, that Dragic paper is fascinating. Its hard to deny from that that there isn’t something going on. Its certainly the cleanest data I’ve seen on Forbush Decreases and an environmental variable (probably because the use of surface stations allows them to include many more FDs than when using satellite data). I look forward to more research involving these techniques, and hopefully we can get some clues into the physics of what is happening. I do want to reiterate again that many Forbush decreases are accompanies by Solar Energetic Particle events that affect chemistry of the stratosphere, so it isn’t necessarily the cosmic rays that are driving the changes. It would be neat to see similar work to this paper where the FD events are divided into cases with and without SEP events. Dragic shows very clearly that FDs with a 7% reduction produces an increase in DTR. But include FDs with only a 5% reduction and the DTR increase disappears. That’s not a very robust result. #28 muoncounter: This is a good point. Though with the 5% criteria there are 81 events, but only 35 events with the 7% criteria. It appears that it needs to be a big event to reach out of the noise (e.g. look at Figure 5). Dr. Pierce#29: Indeed, which makes deciphering the net effect quite a chore. University of Delaware Bartol Research has an excellent graphic of this type of compound event: FD prior to (and after) the GLE. They also list a grand total of 70 GLEs since 1942. Please add SEP [Solar Energetic Particle] and GLE to the Acronym index. There are a lot of paywalls in the references. Does the fact that ammonia is an alkali and the sulfates are acids have anything to do with the effect that ammonia has? Like electrostatic repulsion? Edward (#31): yes, the effect of ammonia is precisely due to the fact that it is a base, and thus enhances the clustering of acids. Other bases like pyridine or amines do this as well, with the strength of the effect depending on proton affinities, number of H-bonds formed, atmospheric concentration, etc. BTW, it is worth noting that while there are thousands of acidic compounds in the atmosphere, there is only a relatively small handful of basic compounds. #30 and #31, thanks for that graphic, muoncounter. I had seen it in the past, but didn’t know it was on the web. Edward, GLE stands for ground level enhancement, which is when a solar energetic particle (SEP) event is detected from the gound. In these cases there is an enhancement of ionization at the ground. This is often followed by the Forbush decrease in ionization in the following days. This paper has a nice overview in the discussion (http://www.atmos-chem-phys.net/11/1979/2011/acp-11-1979-2011.html). #31, Edward: Ammonia being a base and sulfuric acid being an acid is exactly why ammonia aids in nucleation. Ammonia is attracted to the hydrogen atoms that the sulfuric acid doesn’t really want. Organic amines are similar to ammonia in this respect and also aid in nucleation. Good reasoning! I agree with Eli that sulfuric acid (and hence SO2 or other sulfur species such as DMS) is probably the limiting factor for nucleation in clean surroundings. In areas where more than enough SO2 is present (urban, industrial), the limiting factor may be to get the freshly nucleated particles grown to large enough sizes so as to influence the radiation budget either directly (via scattering of solar radiation) or indirectly (via acting as CCN). They may be scavenged (by bigger particles; coagulation) before they’re even noticed (most routinely used instrumentation doesn’t measure the particles until they’re larger than 3 nm in diameter). Thanks for that paper, Bart! The GCR link to cloud formation is interesting but it appears that people clinging to it as a key to AGW need constant reminding that a) there hasn’t been a trend in GCR for the last 50 years and b) that every other influence upon climate doesn’t disappear when you identify another. All the climate influences crowd in together like nursing piglets. Besides, if GCRs had increased enough to cause the warming of the last 50 years would we even be here to worry about it? That’s a lot of high energy particles. I would like to suggest that stratospheric CCN’s can be seen, particularly at and after sunsets. And are relatively more common during El-Nino filling about half the high sky from the horizon. well above cirrus when present, captured above cirrus while flying 35 to 39000 feet. Latest papers? 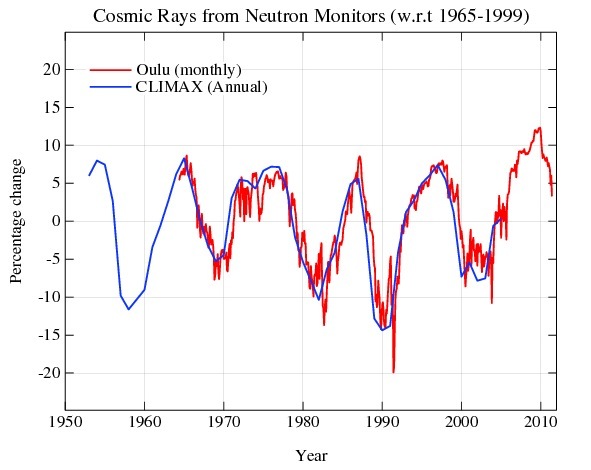 Ari’s http://agwobserver.wordpress.com/2009/08/31/papers-on-the-non-significant-role-of-cosmic-rays-in-climate/ is well updated. I believe the standard theory is that a decrease in GCRs should cause warming: A drop in GCR count reduces low cloud cover causing a decrease in Earth’s albedo. A wonderfully clear explanation of a complex subject. Why did it take so long to conduct a test that was proposed in 2000 by CERN scientists? CERN investigators submitted a proposal in 2000 for the CLOUD experiment and revised this several times … see 2004 revision. Why the delay in conducting the needed experiment? The costs of the tests were not that high, about $10 million US. Was it political opposition to Svensmark’s theory which might conflict with the concept that AGW is “settled science”. Search “Svensmark” on RealClimate and you get 54 hits essentially criticizing Svensmark scientific credentials, research, and lack of integrity. Just one example of scientific collegiality. Rather than personally attacking those who disagree or challenge current scientific theories, run the damn experiment that proves them wrong. I hope we won’t have to wait another decade before we run the needed experiments that answers many of the questions and interactions that this CLOUD experiment generated. Perhaps RealClimate can be supportive this time. I’m confused. My understanding is that low cloud cover produces warmth and high cloud cover is associated with an increase in albedo and cooling. Looking at the Agee et al. draft (still to undergo copy-editing I hope), any CR-cloud correlation indeed breaks down from 2004 or so. But just a side question: I’m a bit confused about that record CR high — should it be visually obvious in their plots? ‘Cause in the Kiel plot, I don’t see it. And the missing filtering at the end of the Beijing plot makes it hard to tell. Very interesting article, thanks a lot. As I understood from Bart Verheggen’s reaction #35, the correlation between GCR and clouds is absent and the correlation with temperature is also about 0. Suppose there would be some small influence of these GCR’s, why would this influence be limited to low-level clouds that have a cooling effect ? At least the Met Office researcher seems to think otherwise and I fail to see the logic also. Am I missing something? #47 Jos, you are correct. It is not clear without understanding the physics why low-level clouds would be affected more than other clouds. Though, it is certainly plausible that some clouds might be affected more than others, we need to keep digging. Your understanding is backwards. Just go outside on a summer day when there’s thick cumulus right above you. The high clouds OTOH are whispier and not great visible reflectors, but they are very cold and thus the presence of high clouds reduces the local radiating temperature, making it warmer. The heliopause is the critical point. And what must also be considered is that the GCR time from heliopause to earth is a substantial lag. Secondly the background GCR also changes as we move through the galactic plane. You cannot simply hope to correlate a direct relationship between solar cycle and GCR and cloud cover – it is much more complex than that.